Winchester Olin Corporation has been making some of the best and highest quality ammo for many years now. Their 12 gauge rounds have always been produced in the United States of America and will continue to be. This is a fact that is extremely important to many American shooters and collectors of their products. 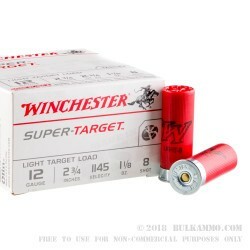 The Winchester 12 gauge Super Target ammo line up is a stellar shotshell that was designed from the ground up to be a better shotgun shell for Trap, and they are great for shooting Sporting Clay competitions. It features a specially designed “hinged wad” for more accurate and consistent shot patterns. The wad also aids in the management of the recoil impulse that is imparted on the shooters’ shoulder. 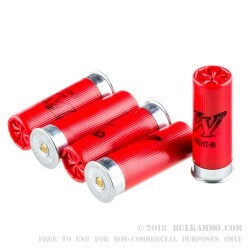 These 12-gauge shells come packed with a 1-1/8 ounce load of #8 Lead Shot in each 2 ¾” shell, making them an ideal round for sporting clay use or trap shooting. 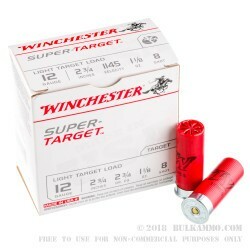 Number 8 lead shot is used in trap and clay shooting to maintain superior pattern density at the shorter ranges that clay shooting is known for. 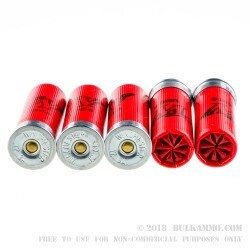 These red hulled low brass shells use pure, proven shotshell powder to give them a muzzle velocity of 1145-feet per second. They come ready to take to the range in ten, 25 round boxes, giving you a grand total of 250 rounds. Get yourself multiple cases for many days of fun at the range.